INDUSTRY.co.id - Jakarta - Toward the coming of 2018, Bank Mayora continues to maximize its business through technology. Director of Mayora Bank Irfanto Oeij revealed, Mayora Bank began to apply to the Financial Services Authority (OJK) related to internet banking and mobile banking. He believes, digital business should be used so that customers do not move to other banks including efforts to improve convenience for customers to transact. 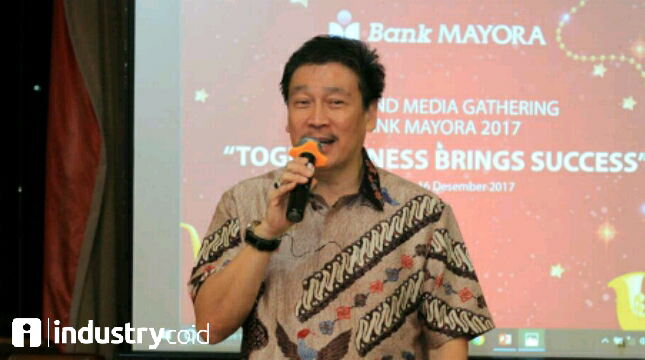 "Bank Mayora in 2017 applied for permission in internet banking and then in mobile banking," said Irfanto, in 'Year End Media Gathering Bank Mayora 2017, "in Bogor, Friday (15/12/2017). Irfanto said, to build the digital business, Bank Mayora has prepared capital expenditure (capex) funds of around Rp30 billion to Rp35 billion. He hopes that these investments can optimize business in the future, including increasing competitiveness. "The digital budget from 2017 to 2018 will be the majority of the capital expenditure for electronics and IT investments of Rp 30 billion to Rp 35 billion.For banks BUKU III and IV may be small, but we have the ability so we gradually with benefits such as in internet bank and mobile banking," he said. As for internet banking has been submitted to OJK including also smart behavior. It is expected that everything can go as expected and will later strengthen the business line of Mayora Bank. This is in line with Bank Mayora's efforts to focus on improving the balance sheet performance at the end of this year. "So what we propose is internet banking, then smart behavior has been proposed.Then everything in 2017 there are some things that need to be prepared and will be crowned in 2018. It must be prepared this digital," he concluded.